Builders and property owners are increasingly interested in energy-efficient green construction techniques like those using structural insulated panels or insulated concrete forms. Therefore, it is important to establish the difference between a structural insulated panel (SIP) and an insulated concrete form (ICF). 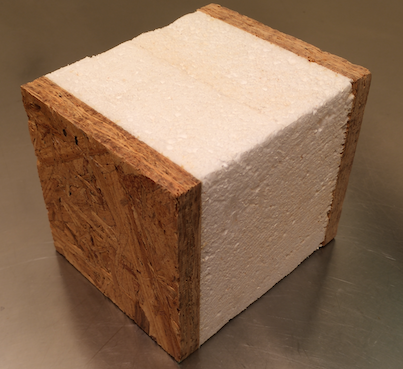 A structural insulated panel (SIP) consists of two structural facings sandwiching a foam core. The outer layers are typically comprised of oriented strand board (OSB). SIPs are made-to-order panels precisely fabricated in a factory setting to an architect’s or designer’s exacting specifications. They are an energy-efficient, cost-effective alternative to traditional wood frame construction. This popular, lightweight green building product reduces jobsite waste and allows for the use of smaller HVAC systems. An insulated concrete form (ICF) is a stackable, modular unit. Some have compared mortarless ICF construction to building with Legos. The interlocking foam insulation panels are filled with concrete often reinforced with rebar. ICF building systems feature high R-value rigid thermal insulation, and they are resistant to natural disasters, including floods, wildfires and hurricane-force winds. Designers often prefer ICF construction in warmer climates and in situations where superior soundproofing is important. At the same time, lightweight, pre-fabricated SIPs are easier install, so they reduce on-site labor costs. ICF construction requires more onsite activity, particularly the installation of the rebar and the pouring of the concrete. In general, SIP construction results in a higher insulation rating. The greater thermal mass of insulated concrete panels make them more suitable in warmer climates. In colder climates, the fact that SIPs warm more readily is advantageous. Sometimes, ICF walls are combined with SIP ceilings to take advantage of the relative advantages of each. ICF wall systems are very strong, while SIP ceilings trap rising heat with greater efficiency. There are also similarities in the two building systems when they are compared to traditional wood frame construction. Both systems significantly reduce the incidence of thermal bridging common with regular stud walls. Both ICF and SIP construction address newer, more stringent building codes designed to reduce energy consumption and carbon emissions. Although both SIPs and ICFs are commonly used in residential and light commercial construction, ICFs are often selected when a structure is more than two stories high, due in large part to the added strength of the integrated concrete. For more information or to learn about insulation, contact USI online to find a branch near you and get a free quote. USI believes in excellence in every step of the process and ensures timely completion and quality of service, time after time. ← Can using the proper insulation actually impact the environment?